Horray! 2 releases in one Blog post! Unfortunately, it’s not because I’m being generous. This release has some peculiarities. To start off, “Kouryaku Casino Bar” might be a somewhat familiar name to someone who has a full ROM set of some sort..
You might’ve even seen this title screen before! Now, this specific ROM dump, what’s so different about it? 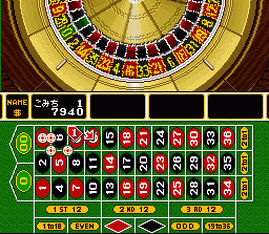 Well, it seems that all I can do with it is play the Roulette game. There’s also an option which returns you to the BIOs, and some… other option. I forget. Anyway, yeah. Before I was able to do all that, I had to try to boot up the ROM. And there’s where I had my problems. On SNES9X, this game will boot up without sound, and for some reason will not let you play the actual Roulette part (wtf?) so I tried booting the ROM up in BSNES… to no avail. Huh? Callis told me he dumped it from a memory pack which also had “Game Tora no Ooana Special 2/24” on it. I requested he send me the “full” dump with both their data, and after I got it, I was able to have BSNES boot the data from both the games up successfully. No, I don’t know why. I don’t think it makes any sense, either. It just happens! Is there some grand mystery of the Satellaview only Byuu knows? Ah, but I can’t be speculating. ^^; Gotta keep moving. So, yeah, for this double release, the RAR file has both the original dump with the merged ROMs, and the split ROMs. I’d recommend running the merged ROM in BSNES if you actually want to play anything. Madhatter has shown to me a bit of a revelation about the nature of the Kouryaku Casino Bar downloads! They’re apparently quite a bit more special than I initally anticipated! ☆Secret Club construction plans revealed! A previously locked house of mystery within the “City” opens as a secret club on October 1. However, the only people that may be admitted are those who have obtained eight pieces of Triforce and who gained the secret club entrance certificate from “BS The Legend of Zelda”.